mythical creatures in the UK mainly consist of cats that may or may not be larger then a normal cat getting used as an excuse by farmers for there dying sheep. (The beasts of wherever). Last edited by muser; 13-10-2009 at 09:06 AM. A cockatrice has the upper half of a rooster and the bottom half of a snake. It can kill with a glance. I recently bought a stuffed and mounted jackalope off ebay from a man in Montana. Indeed, it's a Montana Snarling Jackalope due to its particularly aggressive demeanour. The jackalope hunter wanted an insane amount of money to ship to London so it's currently at my friend's house in Phoenix waiting for her next trip over, when she should have a lot of fun explaining to customs what it is. it'll look lovely on the wall facing my genuine (genyuwine?) steers skull, 5ft horn tip to horn tip, which I bought off a guy in New Mexico. He drives round the desert, finds them, cleans them up and sells them on ebay to wannabe rednecks in South London. 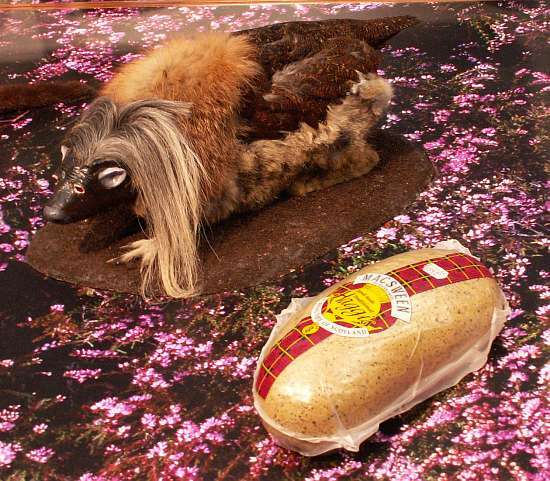 The haggis in the Kelvingrove Museum in Glasgow. I hope it's displayed next to an authentic traditional sporran (a haggis's winter pelt). came across this one in josé donoso's 'obscene bird of the night', currently haunting my dreams. 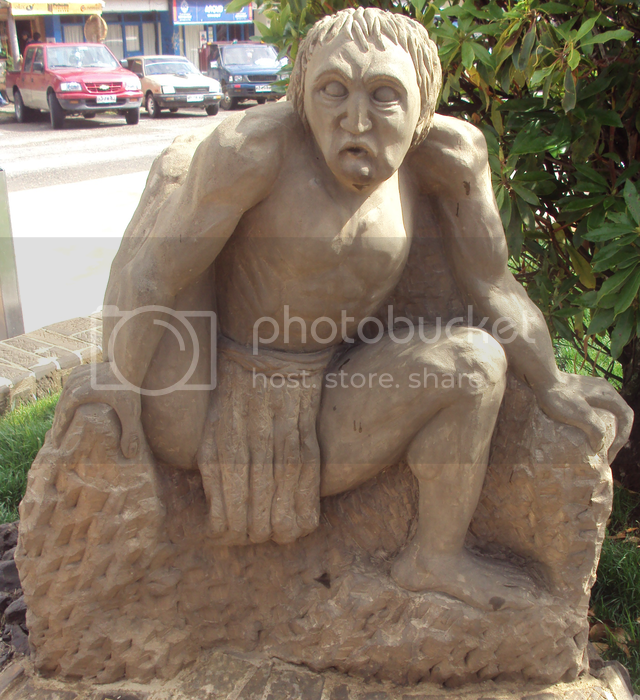 According to legend, the invunche is a first-born son less than nine days old that was kidnapped by, or sold by his parents to, a Brujo Chilote (a type of sorcerer or warlock of Chiloé). If the baby had been christened, the warlock debaptizes him. The Brujo chilote transforms the child into a deformed hairy monster by breaking his right leg and twisting it over his back. When the boy is three months old his tongue is forked and the warlock applies a magic cream over the boy's back to cause thick hairs. During its first months the invunche is fed on black cat's milk and goat flesh, and then with human flesh from cemeteries. Besides guarding the entrance to the warlock's cave, the invunche is used by warlocks as an instrument for revenge or curses. And, because it has acquired magical knowledge over its lifetime spent guarding the cave, even if the invunche is not initiated on wizardry, it sometimes acts as the warlock's advisor. The invunche leaves the cave only in certain circumstances, such as when the warlock's cave is destroyed or discovered and the warlock moves to another cave, or when the warlocks have need of him, and they carry the invunche while he's thrashing and yelling, scaring the townspeople and announcing misfortune to come. The invunche also comes out when the warlocks take it to the Warlock's Council. The invunche is fed solely by warlocks and is only allowed to search for its own edibles if food is lacking inside the cave. empty mirror will be pleased to learn that the legendary JACKALOPE was featured in a University Challenge question the other day.